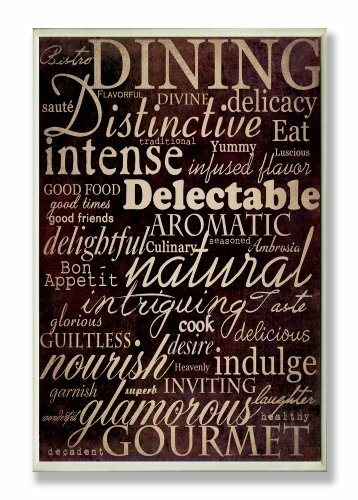 What better way to add class to your home than with a wall plaque from the Stupell Home Decor Collection? With hundreds unique designs you are sure to find the perfect match for wherever you are looking to design. Whether it is the black and white “la toilette” for the bathroom, the damask red rooster set for the kitchen or the distressed inspirational “Live Love Laugh” for the home office, one thing stays the same: each plaque is hand finished, made in the USA, and comes with either colorful grosgrain ribbon or a saw tooth hanger for hanging. The Stupell Home Decor Collection is meticulously crafted by a variety of their in-house artists. Each plaque is mounted on sturdy 1/2-inch thick MDF fiberboard. (Grosgrain ribbon comes on kids plaques as well as all ovals. Squares and rectangles come with a saw-toothed hanger on the back.